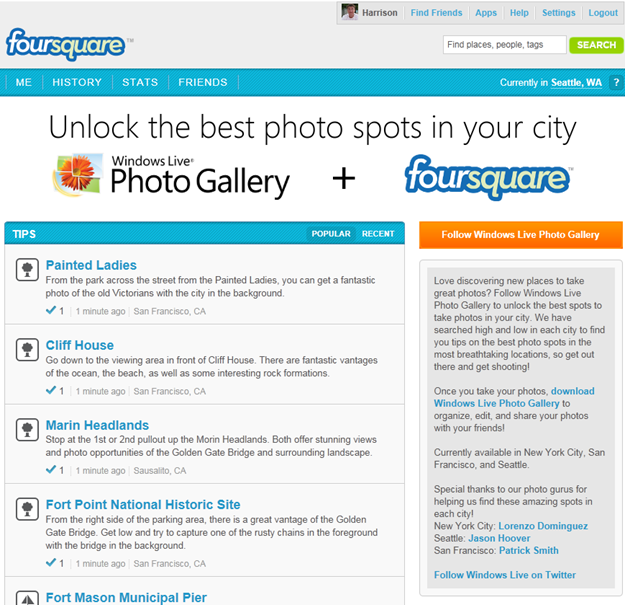 Microsoft is now offering scenic photography advice to Foursquare users starting in three cities: San Francisco, Seattle and New York. Here’s how it works. 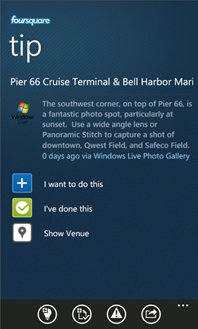 First, you need to follow Windows Live Photo Gallery on Foursquare, then every time you check into a venue that is near a place that professional photographers have scouted out as places to take great photos, you’ll see a Tip popup from Windows Live Photo Galley saying not only where to go, but how to best take the picture. This model of providing experts Tips, is a pretty good one, we have to say. Often when we’re using Foursquare, we ignore the Tips that pop up, even though they are often from people we know, because often they are just recommendations for which donut or beer to get. However, combine an expert’s knowledge with Foursquare’s To Do List and that has a lot more appeal for us as far as Tips go. 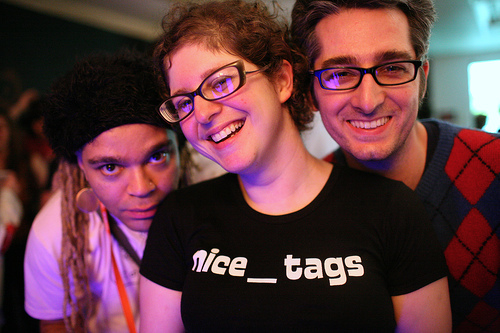 To find these tips you have two options: you can either check-in and be surprised when one pops up, or if you would prefer to just find out where all of the places the experts (Lorenzo Dominguez in NYC, Patrick Smith in SF, and Jason Hoover in Seattle) recommend, you can just visit the Windows Live Foursquare page.